Comfortable and charming apartment set in the heart of Chelsea district, walking distance from King's Road, 5 min walk from the subway station Earls Court, there are also direct buses to Victoria Station or Picadilly, the apartment is located near shops and restaurants. with double bed made of two single beds tied together that can be separated, bedside table, wardrobe, double glazed window overlooking inner courtyard. Please note: This unit only accepts payments via bank wire or paypal (paypal +5% commission). 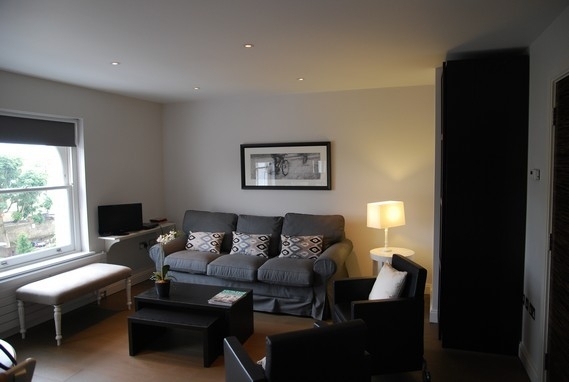 The apartment is located in the brand new complex of Chelsea Walk, completely renovated. It is located in the prestigious street in Fulham Road that from South Kensington to the famous stadium of Chelsea, Stanford Bridge, a few steps from home. It is on the third floor, is equipped with an entrance, new bathroom with tub / shower, bedroom with double bed or two single beds depending on your needs, a living room with sofa bed for two people and kitchen super equipped with washer dryer dishwasher and electric fires new generation. The apartment is equipped with TV, DVD player, dressers and closets plates and glasses. The two windows of the living room open onto Fulham Road and the window of the bedroom by a very large courtyard would silently. A few steps from the house is located Texco a supermarket open 24 hours a 24, and many good restaurants. Under the house there is the stop for buses going in every direction, direct to Victoria Station, South Kensington Piccadilly Circus, Science Museum etc ..